Guess what ya’ll! It was my turn to choose the Tuesdays with Dorie recipe! I had a lot of trouble deciding on one and finally settled on Dorie’s Cherry Rhubarb Cobbler since I’ve recently become obsessed with rhubarb. I had these great fantasies of having a gorgeous picture of this cobbler and making everything perfect since it was my week and all. Yeah, didn’t quite work out for me. The cobbler was delicious (even the rhubarb hater that I call husband liked it) but it just didn’t turn out pretty for me. 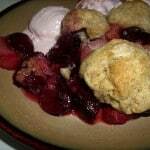 42 Responses to "Tuesdays with Dorie – Cherry Rhubarb Cobbler." Thanks for a great pick! Glad it turned out delicious and that the hubby liked it! Thank you for a perfect choice. I loved it. And your does look yummy! Beautiful pictures. Im glad you enjoyed this recipe. The topping is wonderful! Looks wonderful and perfect for summer! Great pick! I’m so bummed I didn’t have a second to make this. Though the colors on your cobbler are beautiful! Great job! The rhubarb ice cream sounds insanely good. Beautiful cobbler and fabulous pick. Glad you liked the recipe you got to choose! Looks great! This was a wonderful pick for this week! I never paired these two fruits together, but I enjoyed the flavors so much, this may be my new “go to” filling! Your photo looks great! It was tasty, too. Nice choice Amanda! Rhubarb ice cream, that I must try. How about cherry mix-in? Thanks for the selection. I’m bummed that I had to sit this one out due to a sick oven, but I’m looking forward to giving it a go before rhubarb season is over! Great pick! Good summer pick. I love the idea of rhubarb ice cream, I’ll have to try that! Thanks for choosing this recipe this week! It gave me a good reason to try out rhubarb for the first time…i loved it! Thanks for the great pick! Your cobbler looks fantastic! 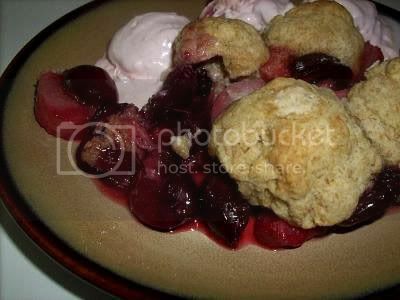 your cobbler looks delicious!! thanks for picking this one, i’ve never used rhubarb before and it had a great flavor! And I’m with the others… your cobbler turned out far more photogenic than mine. I loved the whole wheat in the topping, too. Nice choice! Thank you. Thanks for this selection, it was my first time using rhubarb and I was pleasantly surprised! go Amanda with your bad rhubarb making ice cream self !! so awesome…your cobbler with the ice cream looks fab. Your cobbler looks lovely! Great job! Great pick! Your cobbler looks fabulous! thanks for a good pick–i loved the topping on this one! your rhubarb ice cream is such a pretty pink! You call that not pretty? I call that pretty darned tasty looking! Great pick, I love every excuse to use rhubarb! Great pick, Amanda! I change the fruit, but stuck with the topping as written. It was really good. Yeah! Another rhubarb fanatic! Yeah! I enjoyed the recipe! I am not a rhubarb hater, but there is no rhubarb any more so I substituted it with redcurrants. I should have thought of apples. Thanks for picking this recipe! Rhubarb ice cream! How fun! Thanks for hosting this week! I’m sorry I had to sit this one out, because this is a dessert right up my alley! Thanks for picking something to challenge our tastebuds! Nice job on yours. Thanks for this selection! I love rhubarb and cherries, but I’ve never had them together before. It was great to try. Thanks for a great pick! I had hoped to use rhubarb but couldn’t find it. Cherries and raspberries turned out just fine. I loved the ginger flavor and the part-whole-wheat topping. Thanks for the pick this week! It was nice to do another easy dessert in the busy summer weeks. Homemade ice cream would be perfect with this! Great job! Thank you for choosing such a great recipe :o)! Your cobbler looks very wonderful. I like how your pictures turned out. The humidty here for me kept the whip creme at bay lol. I look forward to your post next week! your cobbler looks great! and rhubarb ice cream? i’d love to try that! thanks for challenging me to finally try some rhubarb :) i agree that the biscuit topping for this was great! 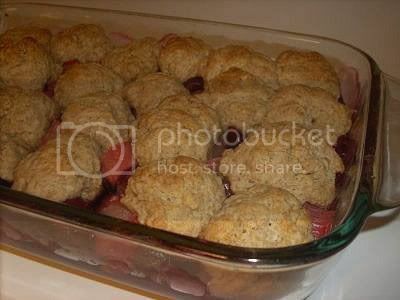 At what oven temperature is this cobbler supposed to be baked? Thanks. Lena, oops. I guess that’s what I get for copying and pasting the recipe. The cobbler needs to be baked at 375.